It is National Mental Health Awareness Month which is a great reason to talk about the invisible injuries firefighters suffer from because of the physical and mental stress of their jobs. 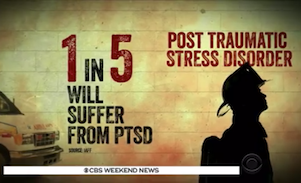 PTSD (Post Traumatic Stress Disorder) is alive and well in the firefighting community. Click on the link below to learn more about how many firefighters suffer from PTSD.